It is nice to hear Jonathan Capehart, Washington Post columnist and MSNBC contributor, on public radio. Capehart’s new program America On the Line debuted September 10th on WNYC and across the country on 120 NPR News/Talk stations and repeaters. The show is live Monday through Thursday from 8pm – 9pm (ET) and is scheduled run through the November 6 mid-term election. America On the Line is similar to WNYC’s Indivisible, a limited-series weeknight program that focused on President Trump’s first 100 days in office in 2017. Though America On the Line is also a limited-series, it has the makings of an ongoing program. 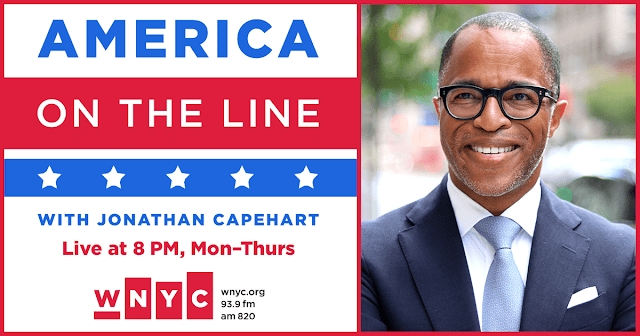 Capehart certainly has a public radio voice and style. He has been a fill-in host and guest on WNYC programs for over ten years. 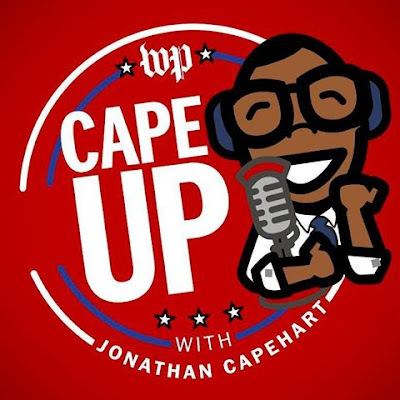 The Washington Post is very supportive of Capehart’s public radio work. According to an article in the Poynter Newsletter [link], Post Editorial Editor Fred Hiatt arranged for Capehart to leave Washington after The Post's Monday morning editorial board meetings and work from New York the remainder of the week. America On the Line opens with little fanfare. Capehart quickly gets down to business by outlining the dynamics of the upcoming discussion. He starts with a live interview with Senator Doug Jones (D-AL) about the current status of the nomination and efforts to have a woman, who says Kavanaugh sexually assaulted her in high school, testify before the Senate Judiciary Committee. The interview with Jones lasted over eight minutes, a bit too long for us. Then Capehart went to the phones. The first caller, Mary in Delaware, was a “hair-on-fire” supporter of Kavanaugh and the second caller, Aveda in Manhattan, was a “hair-on-fire” critic of Kavanaugh. Little light was shed on issues. Capehart thankfully ended both calls quickly. We became concerned that callers were not being properly screened before being put live on the air. There were five calls during this edition of America On the Line. Two were from people on cellphones that had terrible audio quality. An experienced call screener would have never allowed them on the air. Next came the panel featuring conservative pundit Charlie Sykes and Maria Hinojosa, the host of NPR's Latino USA. 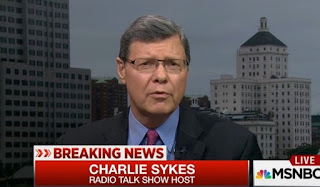 Capehart started the conversation by asking Sykes and Hinojosa if the callers they just heard “exemplify dividing line in America.” Yes, they did” replied the panel. Sykes and Hinojosa then spent the next several minutes discussing the matter. Time flew by quickly. 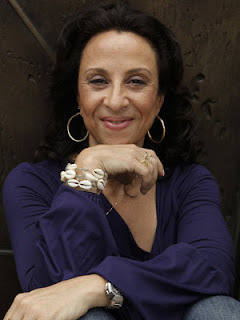 Sykes and Hinojosa are both articulate commentators with a comfortable presence. Trouble began as this edition of America On the Line approached the mid-show break. Before the stop set, Capehart thanked Sykes and Hinojosa as if they were leaving. Then, after the stop set, Sykes and Hinojosa were still there causing a red-face moment for Capehart. Also Capehart announced for the first time that another guest would be appearing during the second half of the show: Astrophysicist Neil deGrasse Tyson. Tyson is a bankable guest who often appears on talk shows. We were surprised he wasn’t promoted as an upcoming guest on America On the Line. The lack of forward promotion, problems with timing and questionable callers led us to wonder who is the producer of America On the Line. We searched and couldn’t the name anywhere. WNYC can do better. Overall, we give America On the Line a B+. The live element is terrific. Capehart is a concise and likable host. The commentators are solid. But more thought needs to be given to how callers are screened and how they contribute to the program. Most of all, America On the Line needs a radio producer who can increase the radio appeal of the show. So essentially this is MSNBC on your radio without having to pay for Sirius/XM?